Taste: Incredible clean and fine jasmine aroma, combinese with honey like sweetness and freshness of tender buds. Important points to brew Jasmine Dragon Pearls using Gong Fu Cha way of preparing tea. 1. Weight of tea – 10 g or three teaspoons on tea pot capacity 150ml. -	second brew – 10 sec. -	third brew – 20 sec. -	forth brew – 30 sec. -	fifth brew – 40 sec. Chinese common brewing metode: Take about 6 - 10g tea on about 250ml glass or pot. Boil fresh water and pour over the tea. Wait about 2 - 3min till buds settles down then sip your tea slowly. After finishing cup more hot water shall be add to make second and third brew. You can make many more brews out, but our experiance says, that following brews should be allowed to infused more time as temperature of water falling down and much of tea contend has extracted in the previous brews. Brewing instruction: Boil fresh water. Take a 5g tea for pot 300ml and allow tea to brew 7min. Product highligths: Chinese tea master has invented excellent tea which preserves it`s flavour for long time, but in same time hasn`t lost gracefulness of leaf appereance. More over, pearl shape has become very popular and highly demanded. 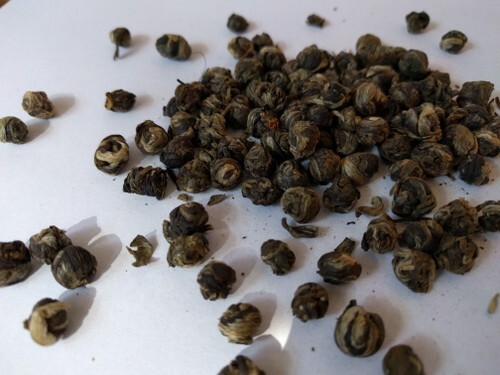 Each pearl is consisting two, three leaf buds attached to long tea stock. All other leaves are removed. Careful rolling, drying and shaping processes are going on till tea acquires necessary form. After final drying tea should be multipaly times flavoured by thick layers of fresly picked jasmine flowers.